Geez Eben, your going to wear that thing out working on it! - Thanks for noticing. I have to admit to being maybe a little too fixated on perfection of my RIX SA3 compressor. The thing is, I recently figured out a few things that took it right up to full capacity on it's fill rate. The spec says 3.0 cfm and I'm running 2.9-3.1 cfm depending on temp and humidity. That's IT... The goal has been reached. There isn't anything else to do to my RIX but improve on the window dressing. 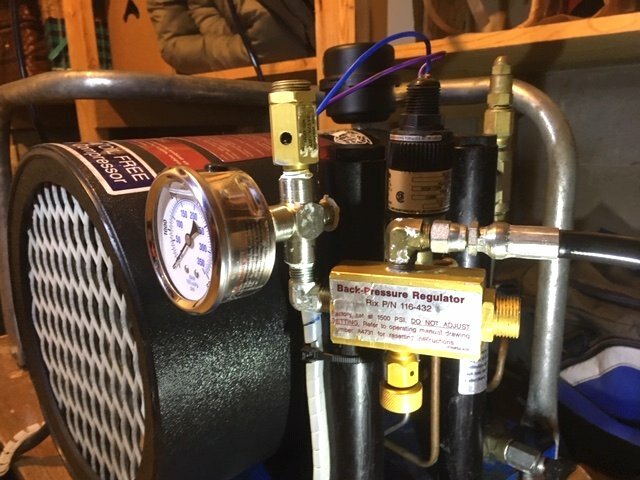 - There's a RIX expert on another forum that commented on my plumbing... That it was hanging out there too much and might cause damage from vibration. So, THAT's why I'm working on the plumbing. PLUS, I just like working on it I guess. P.S. I need to go diving so I can re-fill some tanks with my RIX SA3. Don't forget May 3-4 is Wazee. May 17-18 is Fortune! - This puts everything as close as possible to the outport of the moisture condenser. I could have gone vertical with the BPR but I like the way it is with air going up and condensation going down so I have another place to drain from. - I tried the PTFE thread sealant and not only made a mess of it but it ended up not sealing well. Took everything apart and re-assembled with 6 wraps of tape. No more leaks! - I filled an AL80 to test it out and everything is working fine... Ready for Summer. It's looking good. You have inspired me to make some changes to my fill system. I'll put up some photos in a new thread soon.